Complete 12 ED training courses to become a Certified Higher Education Professional (CHEP) in Teaching. CHEPs can meet their annual continuing education requirements by completing 2 courses from any training area. This course will provide you with an overview of Universal Design for Learning (UDL) and help introduce you to this research-based educational framework. UDL helps instructors develop flexible learning environments to accommodate learners’ learning differences. This course will provide a working definition and information pertaining to various components of UDL. Contrary to some current notions, it is the responsibility of ALL instructors to include literacy development in their instructional planning and delivery, regardless of academic, vocational, or professional discipline. This course defines literacy skills, including new and newer literacies, and describes how instructional planning must include all areas of literacy development for every student. Throughout this course, participants will have an opportunity to apply various strategies and methods in literacy development and understand how to focus on the aspects of literacy that apply specifically to successful students in their discipline. This course emphasizes teaching strategies that can be implemented within different types of lessons to promote teacher proficiency, student motivation, and achievable outcomes. Topics relating to teaching methods include direct, indirect, interactive, and independent instruction. By utilizing various teaching strategies and methods, an instructor can approach teaching topics in a variety of ways. The goal of this course is to help develop a better understanding of essential teaching strategies, and produce tangible resources to help implement plans, strategies, and ideas at your institution. In addition to lecture videos, resource links, and assessments, you will be able to utilize Journal and Learning Activities, which will continue to be useful after successful completion of the course. Career education programs prepare students to perform job tasks successfully in their chosen trade or profession. Providing opportunities beyond traditional quizzes and exams allows students to demonstrate and assess these skills and aids in this preparation. This course focuses on how you, the instructor, can identify and implement alternative assessments that support expected course outcomes and allow students to demonstrate their level of competency for a skill or task. Did you ever hear that we only use about 10% of our brains? Were you ever told that you are more right-brained or left-brained? Did you know that males and females learn differently as a result of differences in their brains? Did you know that people have different learning styles? Did you ever hear that you retain more of what you do or see than of what you read or hear? If you answered "yes" to any of these questions, you have experienced a "myth-understanding." The purpose of this program is to explain the background and truth about these myth-understandings that pervade much of the popular literature to this day. All persons who are involved in the education of others must guard against these myths and ensure that they do not influence their professional practices. Motivation can be the difference between success and failure. In this course, the idea of how motivation impacts people will be discussed. Activities will focus on improving motivation in students, and other people you interact with, as well as yourself. The goal of this course is to help develop a better understanding of the topic, and produce tangible resources to help implement plans, strategies, and ideas at your institution. In addition to lecture videos, resource links, and assessments, you will be able to utilize Learning Activities, which will continue to be useful after successful completion of the course. Crisis management begins with creating and implementing a plan of action that can be executed efficiently and quickly. As an educator, it will be important to recognize signs of crisis in yourself, fellow coworkers, and even students on campus. If you are an administrator, it not only takes a keen eye to recognize signs of crisis in yourself, but this also applies to recognizing crisis in others around you. In this course, you will explore the various aspects of a crisis, how to identify individuals in crisis, and how to appropriately respond to those individuals to improve the overall situation. This class will review communication, collaboration, and time management soft skills that can be instilled to help a student excel not only in the classroom, but also on the job. A variety of ideas and methods to implement the growth of those soft skills will also be shared in the course. Learning content is only part of the goal to empower students and graduates to be attractive to potential employers. The human side of the business world – the people – is what makes a company great, so it is imperative to foster the learning of both content and soft skills as students travel on their educational path to a job and career. This class will review adaptability, problem solving, conflict resolution, self-motivation, and feedback soft skills that can be instilled to help a student excel not only in the classroom, but also on the job. A variety of ideas and methods to implement the growth of those soft skills will also be shared in the course. Learning the content is only part of the goal to empower the students and graduates to be attractive to potential employers. The human side of the business world – the people – is what makes a company great, so it is imperative to foster the learning of both content and soft skills as students travel on their educational path to a job and career. Awareness about autism and the impact it has on the lives of those that have been diagnosed with it has grown greatly in the past few years. There has been an increase in enrollment of students who are on the autism spectrum in career education. This course will provide you with the characteristics of autism so that you will have an understanding of what autism is and how it impacts the learning of these students. Specific strategies for working with students who have been diagnosed as being on the autism spectrum will be provided, to enhance the engagement and learning success of students with autism. Students with learning disabilities are enrolling in career education at increasing rates as a result of successful interventions and supports provided during their elementary and secondary schooling. This course describes the characteristics of students with learning disabilities and how having a learning disability impacts their learning process. As reading and comprehension is the essence of learning, it is important that instructors be knowledgeable in ways to support students with these learning challenges. Specific strategies for working with these students will be offered, to enhance the engagement and learning success of students with learning disabilities. As students from different generations are enrolling in colleges today, instructors are presented with the challenge of how to engage, instruct and relate to these multigenerational learners. This course gives profiles of different generational learners and how they engage in the learning process. Content is shared on how to relate to learners of the different generations and how to use students’ life experiences as learning opportunities. As technology is an essential part of instructional delivery, strategies are given for building on the abilities of multigenerational students to use social networks, portable media (given the parameters of school policy), and personal interaction. In addition, instructors are given methods that can be used to help students develop the critical thinking and interpersonal skills needed for career success. Cultural diversity includes a wide scope of differences. While we plan instruction to meet outcomes that are usually supporting a set of pre-determined standards, instructors are faced with a high level of diversity in every class group. It is important for instructors to be aware of diversity and strive to include every student, regardless of difference, in their learning community. This requires intentional planning and accessible instructional design that includes all students and empowers every student to succeed. The purpose of this course is to build cultural competency in instructors who teach students from diverse backgrounds. This will include a review of critical terms, ideas, and real-world case studies, providing instructors and administrators with useful information and takeaways they can apply to their practice. The goal of this course is to help develop a better understanding of cultural competency and produce tangible resources to help implement plans, strategies, and ideas at your institution. In addition to lecture videos, resource links, and assessments, you will be able to utilize Journal and Learning Activities, which will continue to be useful after successful completion of the course. While educators increasingly use technology in the lab setting, many don’t know where to start when trying to use it during didactic instruction. Furthermore, administrators have a hard time rolling out these initiatives. This course will go through the stages of a solid rollout plan to take advantage of available technologies. It will also discuss how to teach with technology as an enhancement to education, not a replacement. This course helps instructors, administrators and support staff to better understand how to use these tools. This course covers the impact that personal electronic devices, in this case tablets, have on the delivery of instruction. The course discusses the reasons for using tablets in classroom and lab settings to enhance learning and expand educational resources for students. Strategies are given to enable instructors to see how the use of tablets can assist students in becoming active learners both within and outside of the school setting. Service learning programs help students take their knowledge and skills out of classrooms and labs into community settings enabling them to use critical thinking and problem solving abilities. This course provides information about the advantages of using service learning as a teaching tool while enhancing the growth of students. Implementation steps are covered so participants will be able to make service learning a part of program offerings as well as providing career opportunities for students. Experiential learning is intended to extend students' educational experience beyond the traditional classroom setting. It is a structured, student-centered way to integrate curriculum-based educational experiences utilizing practical applications and active involvement. This course discusses strategies for extending the curriculum into the workplace. Information is provided on how to educate the internship site and how to create useful forms and processes for documenting and implementing successful internships. This course describes the different roles of the institution, the student, and the internship site. It will identify ways to supervise students, as well as ways to evaluate and assess student success at internship sites. Have you been frustrated in your allied health classes when students don't "get it"? Have you tried repeatedly to teach a difficult student and it didn’t seem to work? Sometimes it is a difference in learning styles that creates this misunderstanding. In this themed course, you will learn the eight different learning styles of your health students as well as how to teach to them in a variety of practical ways that are fast, easy and effective. This course follows an interesting "fairy tale format," with several characters you will meet here and may see in your classroom. This course covers the different roles that culinary arts instructors play in the instructional process. The content provides rationale, strategies and methodologies that beginning as well as experienced culinary arts instructors can use in their classes and kitchens. Instructional best practices are discussed and examples given that will expand the knowledge base of culinary arts instructors as they prepare lessons. This course covers student centered instruction and information about the impact of student learning preferences on instructional planning and delivery. As a hands-on instructor, have you ever asked yourself, “I taught it, but did they learn it?” Have you ever struggled with developing evaluation tools relevant to the hands-on field? This course shifts focus from teaching to learning. It advocates for a learner-centered, competency-based classroom where quality evaluation is crucial. The course uses Bloom’s taxonomy as a guide for developing learning outcomes and the assessments to measure student success. A variety of evaluation tools and rubrics are introduced. Authored by Angie Myer, former massage educator/administrator and content specialist for the Commission on Massage Therapy Accreditation (COMTA), the course also introduces national standards in the field. It uses the COMTA Competencies and the Entry-Level Analysis Project (ELAP) learning outcomes as examples. The course objectives are aligned with the Alliance for Massage Therapy Education (AFMTE) Teacher Competencies, but the course can be applicable to beginning or veteran instructors of any hands-on field. Complete 12 EL training courses to become a Certified Higher Education Professional (CHEP) in Online Teaching. CHEPs can meet their annual continuing education requirements by completing 2 courses from any training area. This course will provide you with the basic foundations of assistive technology and its use in the online learning environment. As a greater number of students with disabilities are entering online education, this course will prepare online faculty to meet their unique needs. You will learn about the obligations and legal responsibilities under U.S. federal law. In addition you will explore ways of assisting students with disabilities to succeed in the online learning environment. We will help you identify the appropriate tools, introduce you to universal design, and provide strategies that can make your online course accessible to those with disabilities. Online accessibility is beneficial to all of your learners! This course will provide you with an overview of Virtual Reality (VR), Augmented Reality (AR), and Mixed Reality (MR). With the advancements that have been made in providing reality-based instruction, this course will help instructors to stay current with the latest developments in the different types of realities that are available as instructional supports. This course will provide working definitions for each of the realities, and information pertaining to various components of teaching online using these realities. Benefits, challenges, and best practices will also be discussed. Real-life applications of VR, AR, and MR, along with various equipment that may be utilized, are provided. This course will provide you with strategies and techniques to immerse students in an interactive environment that will incorporate gaming and simulations to introduce, engage, and reinforce online learning. This course will begin with definitions of gaming and simulations as a tool for online learning and will provide guidance to evaluate, implement, and assess the effectiveness of games. Complete 12 training courses from the list below to become a Certified Higher Education Professional (CHEP) in Admissions. CHEPs can meet their annual continuing education requirements by completing 2 courses from any training area. A minimum of 6 courses must be taken from the core training area. Asking questions is an essential element of communication, especially when working with students. This course provides an in-depth understanding of the purpose and types of meaningful questions. You&apos;ll be introduced to fresh techniques as well as a framework to help refine your questioning to an art. In addition, the course examines the counterpoint of questioning — skillful listening — and how both are necessary to be the most effective. Let’s face it, today&apos;s students have a plethora of information at their fingertips; but can they truly understand in a meaningful way all that your school has to offer? This course takes product knowledge and presentation skills to a higher level with enhanced tools and techniques to improve your "sales" skills. Additionally, advanced methods for presenting the attributes and benefits of your institution will be explored, along with successfully addressing challenges and resources. In this course, we will examine the fundamentals of value, benefits, and worth. In addition, we will utilize techniques and tools to prepare and present the value of your institution. Finally, we will review tips and best practices to maximize your value presentation. Once you have completed the course and activities, you will be prepared and ready to best serve your students and school with your value presentations. The most successful admissions professionals are those who maintain a positive attitude and energy, but maintaining that positivity each and every day can be tough. This course focuses on the importance of understanding and building your personal attitude and energy to maximize your effectiveness. You will have the opportunity to assess your attitude and energy and manage these elements to maximize your performance. In this course, we will examine the fundamentals of attitude and energy and understand why they are so important to your success. In addition, we will utilize assessments to look at your current attitude and energy levels. Finally, we will review tips and best practices to enhance your energy and attitude output. Once you have completed the course and activities, you will be prepared and ready to best serve your students and school by maximizing your personal attitude and energy. Today’s admissions professionals need expanded methods to adapt to where the prospective student is in the decision-making process. Whether you work with students online, face-to-face, or a little of both, adding variety will help you successfully connect with your students. In this course, you will discover ways to improve your connections with prospective students, best practices for inbound and outbound communication, how to address challenges in the moment, and methods for effective follow-up that improve your effectiveness as an admissions professional. This course uncovers the secrets of today&apos;s successful businesses and their strategies of first-class customer service. You will learn the components of first impressions that can help you increase and keep your enrollments. This course will also help you to locate the specific areas of your operations where you can implement an improved customer service plan for your institution - whether it is admissions, student services or academics. Skillful writing helps you accomplish your business objectives and extends your influence as a manager. In this course, you will learn to create clearer, more effective written communications. The course includes specific guidelines for preparing memos, letters, emails, and other common business documents. Feedback is an essential component of the communication process. In this course, you will learn when and how to give effective positive or corrective feedback, how to offer feedback upward, and how to receive feedback. In this course, you will learn how to manage your career - including how to identify your business interests, professional values, and skills in order to target your most exciting career possibilities. In this course, you will learn the difference between positive stress that enhances productivity and negative stress that breeds tension, lowers productivity, and undercuts job satisfaction. The course includes strategies for dealing with underlying causes of worry and stress, with tactical advice and coping mechanisms for immediate problem management. In this course, using your accrediting body’s criteria, you will study the language and intention of accreditation. Participants will develop a different perspective on the self-study process and an understanding of how to craft the self-study report to effectively communicate how present practices meet the standards. Discover what the standards really are and what it takes to meet them, interpret and communicate your institution’s current operating practices in the context of the criteria, and develop a more accurate understanding and expression of how your institution can provide the evidence needed to demonstrate compliance. Is your campus ready for a full unannounced visit at any time? Onsite visits are becoming more frequent in recent years and unannounced visits even more so. This training is designed to aid campus leaders to be prepared, using best practices and practical tools, to host an onsite visitor at any time, including visits that are unannounced, by any organization such as state agencies, veterans’ organizations, regional, national and programmatic accrediting agencies and the Department of Education. Complete 12 training courses from the list below to become a Certified Higher Education Professional (CHEP) in Career Services. CHEPs can meet their annual continuing education requirements by completing 2 courses from any training area. This course offers strategies to provide employment and job search skills training that enables students to seek jobs in the field for which they are trained. You&apos;ll learn how to offer comprehensive career services regardless of whether your career services department is staffed full- or part-time. The course provides strategies for an institution to set up a Career Services Department, enhance and run it, and measure results. It describes how a successful career services department can ensure that your students have the skills and self-confidence to succeed in the workplace. You&apos;ll learn techniques to increase placement rates and reach out to the community to meet and maintain relationships with hiring decision-makers. In this course, you will be given tools to help your students find the job that's right for them, present themselves impressively on paper, and interview with ease. This course is designed so you can successfully support your students in four phases of their job search: doing a targeted job search, writing a powerful resume and cover letter, presenting professionally, and developing effective interview skills. Social media is critical tool for career services professionals to interact with and reach their constituent groups yet many career professionals aren't aware of how to develop a purposeful social media strategy. Without a social media strategy, career services departments risk losing relevance with their audience, and they also lose the opportunity of harnessing social media to achieve department goals. This course describes the phases of planning and implementing a social media strategy for your career services department. Each module is based on the fundamental steps of preparing a comprehensive and measurable plan to achieve the goals of the career services department. Educational institutions have opportunities to create unique alumni associations which will look and feel more like alumni communities. This course will show you how you can create active alumni communities to increase enrollment, retention and placement for your entire institution. You will learn how to provide your alumni with valuable services and how to seek their help to enhance your educational programs and career services, as well as marketing and admissions. From getting started to setting up an alumni data base management system and determining the institution's return on investment, this course provides you with operational strategies for establishing an effective alumni association. Although job developing requires a mix of critical skills, many career advisors are forced to learn them through the “sink or swim” method. They’re often asked to immediately make a specific number of cold-calls daily. They learn that “job developing” is synonymous with cold-calling. It isn’t. This course covers how to properly prepare for job developing, how to prospect, prioritize employer contact, and communicate with employers to address objections, get job orders, manage them to completion, and continuously engage employers and candidates to develop long-term partnerships. Job developing should be more comprehensive than a simple list of employers to cold-call. In today&apos;s world where jobs are posted online, matching algorithms screen digital résumés, and recruiters source candidates online, students must market themselves online. Writing a résumé and cover letter alone is no longer an adequate skill set for career seekers to successfully find and secure employment as well as manage, advance, and transition their career throughout life. Students must know how to digitally market themselves, and 21st century career advisors must know how to advise them. This course will help you advise students on developing digital career-marketing strategies for career success. Military veterans represent a unique type of non-traditional student and must overcome distinctive challenges to reintegrate into the civilian workforce. With an influx of over one million veterans projected to enter higher education in the next several years, career services personnel must be prepared to provide the level of service these students need and deserve. This course helps career services practitioners understand the unique obstacles veterans face in the reintegration process, how to help them translate their military experience into civilian language and provides strategies & tools that can support veterans in becoming gainfully employed. Securing gainful employment for students with an arrest or criminal conviction is filled with unique challenges. This course introduces many of the challenges your students have (and will face), not only from the student’s perspective, but also from the employer’s. Upon completion of the course, you will be in a position to counter potential stereotypes and ‘negligent hiring’ fears. Topics of study include reviewing effective interview practices and the importance of honesty, how attitude lays the foundation for success or failure, the value of developing a letter of explanation, as well as reviewing techniques to mend a problematic past. Students with disabilities represent a unique minority group within higher education. Despite being the largest minority group in the world, all too often their access to and inclusion in programs and services comes as an afterthought. Career services practitioners pride themselves in their ability to serve diverse populations, yet many remain untrained in working with disabled students. This course helps career services practitioners understand federal legislation basics as they relate to disabled students, the unique challenges they face, and characteristics of the population as well as practical resources and career services strategies to help overcome their unique barriers to employment. **While the course addresses interaction considerations for those with deafness, blindness, learning disabilities, acquired brain disabilities, and physical disabilities, it shouldn't be expected that the course will cover all possible disabilities you may want to specifically learn about. It provides a broad overview. There are millions of lesbian, gay, bisexual, transgender, and queer (LGBTQ) job seekers struggling to find careers and even hold down a job, due in part to their sexual orientation and gender identity. What amplifies this issue is the fact that many college career advisors who are supposed to help struggling jobseekers are not trained to address the unique struggles their LGBTQ students face in their career development. This course equips career advisors with the perspective, knowledge, and practical skills necessary to provide quality career services for their LGBTQ students, who greatly need their assistance. In the most competitive economy ever, crafting powerful job search documents, communicating strategically with employers, and presenting evidence of one’s qualifications won&apos;t even necessarily get candidates jobs – it’ll barely get them interviews. This course covers advanced writing techniques, shows examples, and offers detailed strategy explanations to help career professionals enhance their ability to teach students how to craft modern job search documents and strategic employer communications. You&apos;ll be able to more effectively advise students on how to use impactful strategies that differentiate them from competitors through résumés, letters, portfolio evidence, and strategic post-interview correspondence. *This course also contains several downloadable resources to be used in your career center. Help students ace the interview with successful tactics to showcase their qualities and make them the best fit for the job. A career management specialist will be able to master the appropriate actions for students to take before, during, and after the interview. These tactics can then be implemented in a career management class or during the preparations for prospective job interviews. The goal of this course is to help develop a better understanding of the topic and produce tangible resources to help implement plans, strategies, and ideas at your school. In addition to lecture videos, resource links, and assessments, you will be able to utilize Journal and Learning Activities, which will continue to be useful after successful completion of the course. Derived from the feedback of over 100 institutions, empirical research, and case studies, course participants are presented with specific strategies and best practices that promote graduate employment. This course is for all education professionals seeking to understand the institutional practices that maximize graduate employment outcomes. Because employment outcomes are as much a function of institutional behaviors as they are of student behaviors, this course is based in systems thinking, which challenges participants to examine the interdependent relationship among institutional infrastructure, student career-readiness, and graduate employment rates. Accurate representation of graduate outcomes is critical to upholding institutional integrity. All involved in employment reporting must continuously identify ways to strengthen their system for tracking, collecting, and verifying employment data. When documentation is both a quality and a compliance matter, staff must understand the verification program as a whole, the role they play in continuously improving it, and how to use professional principles and best practices in documentation. This course is designed to encourage participants to critically analyze their own employment reporting practices while sharing ideas and best practices that can help lead to the highest level of data integrity. Complete 12 training courses from the list below to become a Certified Higher Education Professional (CHEP) in Campus Operations. 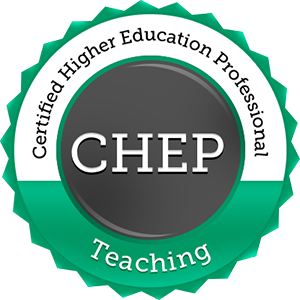 CHEPs can meet their annual continuing education requirements by completing 2 courses from any training area. This course is designed for the financial aid representative who is familiar with the financial aid process, and the campus manager seeking to learn more. The course provides a detailed review of the FAFSA to ISIR/SAR application process, concentrating especially on the technical aspects of the process beyond timeliness and accuracy. The importance of documenting verification and clearing comment codes will be explored, in addition to your role in using professional judgment. With a seemingly endless stream of new laws and regulations, institutions have become burdened with ensuring they are compliant, while continuing to give great customer service to their students and families and all while achieving larger institutional goals. The role of the Financial Aid Office in compliance cannot be underestimated, but the Director of Financial Aid cannot ensure compliance in a vacuum. This course is designed to examine the fundamentals of law and regulation, and of the enforcement process. More importantly, this course provides tools for School Directors, Chief Financial Officers, Enrollment Managers, and Financial Aid staff to develop and build compliant practices that don’t interfere with effective operations, customer service or institutional goals. What will your institution look like in five years? Growth takes change and the commitment of the stakeholders in your organization. A five-year plan is essential for any owner or director of an educational institution, no matter how long they have been in the business. It includes various elements such as your enrollment goals for all programs, plans for new programs, new profit center potential, fees and all financial aid opportunities, enhancement of student services, faculty and staff planning, marketing and development strategies, and planning for physical space to support your expansion goals. Also, development plans are often needed to satisfy licensing and accreditation requirements. This course covers the essential components and techniques involved in developing a comprehensive five-year plan. We will show you an effective step-by-step planning process that involves the participation of representatives from your institution including staff, instructors, students, graduates, and the employers who hire your graduates. The process encourages participants to share their knowledge and ideas, and everyone who participates in the process ultimately becomes a stakeholder in making the plan work. The course includes planning worksheets that you can download and use to help you develop your institution’s five-year plan. Educational institutions need to be aware of emerging employment opportunities in new and expanding fields if they are going to continue to attract students. Most licensing and accrediting agencies ask an institution for some form of feasibility study when submitting new program-add applications. The research involved in this step often requires proof of need for the program, number of anticipated job openings, and input from employers. This course outlines ways to collect data to make an effective decision and show regulatory agencies proof of employment opportunities. Step-by-step directions are included to assist institution staff in conducting effective research and preparation of curriculum to meet employer specifications. It is no longer news that predictive learning analytics are changing online classroom instruction. This course teaches current trends in locating, hiring, monitoring and retaining the best professionals that specialize in online instruction. More importantly, this course provides insights for using the new predictive analytic approaches to optimize management of online faculty. Generalized "best practices" are waning in favor of real-time monitoring for individualized qualitative and quantitative analyses. This real-time approach provides significantly increased student success and retention. Also addressed in the course is how to build a strong faculty management team, continuing faculty development recommendations and various business considerations. Financial management can be a daunting task. This course covers the essential concepts of finance, budgeting, forecasting, and planning for non-financial managers. In this course, you will learn about the budget process, different types of budgets, and common budgeting problems so you can allocate resources wisely to meet your goals. This course will show you how to create an effective business case, from defining the opportunity and analyzing alternatives to presenting your final recommendations. This course will take you step by step through the process of preparing an effective plan for a business proposal. The steps you will learn are applicable to launching a new internal product as well as seeking funding for a new start-up business. In this course, you will learn what business processes are, why improving them is essential, and how to carry out a business process improvement (BPI) initiative. This course provides a review of financial and non-financial measures used in all areas of organizational performance. The course addresses both standalone measures (including ROI, EVA, and BET) and measurement frameworks such as dashboards, quality models, and the Balanced Scorecard. It also includes a systematic process for tracking performance of initiatives that can generate improvements across the organization. This course provides an overview of the methodology and guidelines to help you outline an audit plan for your institution. You will learn how to define audit scope and determine the audit approach which fits your organization. The course provides tips for successful audits and reviews audit areas for each functional department of a typical campus, including admissions, financial aid, student accounts, education/academics, and career services. Other business areas including marketing and advertising, human resources, information security and other key areas are also reviewed to provide you with a full scope audit outline. The course concludes with information on reports, audit documentation, and follow-up recommendations following the field audit activities. Complete 12 training courses from the list below to become a Certified Higher Education Professional (CHEP) in Leadership. CHEPs can meet their annual continuing education requirements by completing 2 courses from any training area. LS101 Do You Manage Or Lead? LS102 How Do You Lead? In this course, you will learn what it means to be a manager, as well as how to navigate the complex and often stressful transition from individual contributor to a new manager. In this course, you will learn how to establish a team with the right mix of skills and personalities and create a culture that promotes collaborative work. The course covers steps to leading an effective team and includes innovative, easy-to-implement self-evaluation tools. This course provides a timesaving guide to planning and conducting meetings from start to finish. It covers preparation, keeping the meeting on track, and follow-up. The course also offers expert advice for dealing with problem behaviors exhibited by meeting participants. How well do you work with your supervisor? This course will help you develop a mutually rewarding relationship with your supervisor. You will learn proven techniques for effectively communicating and negotiating with your supervisor, presenting problems or opportunities and accepting responsibility for your proposed actions. This course provides concrete suggestions for forming virtual teams, including assessing their technology and communication needs, structuring the team to build trust, and keeping the team on track. In this course, you will learn how to manage diversity to extract maximum value from your employees' differences - including how to recruit diverse talent, resolve diversity-related conflicts, and communicate with employees and customers from other cultures. In this course, you will learn how to identify the particular skill set needed for a job, and then how to research and interview leading candidates until you find the one who best fits your need. This course will show you how to choose what to delegate, match employee and delegated assignment, and set the stage for success by both developing your employees and freeing up your time for critical managerial tasks. Why do employees stay with - or leave - their jobs? In this course, you will learn strategies for attracting and keeping top performers, how to handle common obstacles to retention such as burnout and work/life imbalance, and how to develop programs that address the diverse needs and interests of your workforce. This course will show you how to encourage your employees to learn and grow, while maximizing the return on the management time you invest in employee development. In this course, you will learn how to prepare for, conduct, and follow up on performance evaluations in ways that link employee performance to your company's and group's goals. In this course, you will learn how to effectively manage a layoff - including making key decisions before, during and after the critical event. Handled skillfully, a layoff can set your team, and your institution, - on a positive new path. Dismissing an employee is one of the most difficult and painful tasks a manager can face. In this course, you will learn how to effectively manage a dismissal - including making key decisions before, during, and after the critical event. Change is constant and is often met with resistance. This course will show you how to manage change constructively and navigate the ups and downs that inevitably accompany a change effort. In this course, you will learn a practical, hands-on method for looking at crises. The course will show you how to develop a crises audit to avoid and prepare for crises, how to manage an actual crisis, and how to learn from past events. In this course, you will learn how to identify underlying issues related to a decision, generate and evaluate multiple alternatives, and then communicate and implement your decision. This course provides practical advice for managers in charge of shaping and executing organizational strategy. The course includes tips for analyzing opportunities, challenges, and the potential consequences of high-level action plans. It also addresses identification of broad patterns and trends, creative thinking, analysis of complex information, and prioritization of actions. In many educational institutions, corporate executives and campus management are involved in the strategic planning process. This ensures that organizational strategies - both corporate and campus level - are tightly aligned and that successful implementation can follow. In this course, you will learn what strategy is, how senior management and units work together to develop strategy, and how units support an organizational strategy by developing and executing action plans for strategic initiatives. This course will show you how to manage an intellectually diverse work group and their environment to produce more and better ideas that encourage innovation when developing products and work processes. In this course, you will learn how to implement an innovation from crafting a vision statement to gaining support and managing resistance. This course is a must if you want to turn an idea into reality.